To celebrate the fun and help you celebrate summer, we are throwing a Pinterest Party! Come join in, Pin and Repin and you could win a year's supply of Tombstone Pizza! Join the #GrabSummerFun Pinterest Party from June 15, 2012 – July 2, 2012. We are giving away a year’s worth of Tombstone Pizza! Sign into your Pinterest account or if you do not have a Pinterest account, visit Pinterest.com to request an invitation to register for a free account. There may be a waiting period in between when you request membership and when you are issued an invitation. Create a #GrabSummerFun board on your Pinterest page. The title of your board must contain #GrabSummerFun. “Pin” five (5) summer fun and party ideas (Party Decor, 4th of July Fun and Treats, Summer Fun, etc.) on the #GrabSummerFun Pinterest Board. 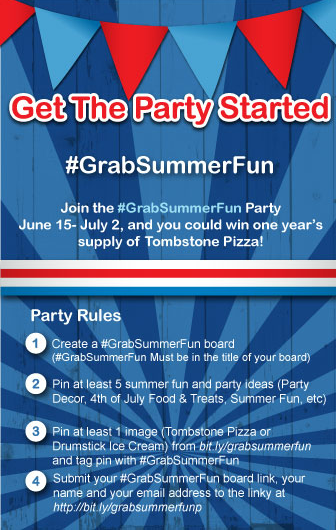 Grab one image from #GrabSummerFun Pinterest Board of Tombstone Pizza or Drumstick Ice Cream and Pin it to yours with hashtag. Come back and submit your name, email address and your #GrabSummerFun Pinterest Board link to bit.ly/grabsummerfunp (the linky on the party host’s RSVP post). Have fun, get inspired, inspire others….and good luck on winning a year’s worth of Tombstone pizza!